When Kenneth Burke conceived his celebrated “Motivorum” project in the 1940s and 1950s, he envisioned it in three parts. Whereas the third part, A Symbolic of Motives, was never finished, A Grammar of Motives (1945) and A Rhetoric of Motives (1950) have become canonical theoretical documents. A Rhetoric of Motives was originally intended to be a two-part book. Here, at last, is the second volume, the until-now unpublished War of Words, where Burke brilliantly exposes the rhetorical devices that sponsor war in the name of peace. Discouraging militarism during the Cold War even as it catalogues belligerent persuasive strategies and tactics that remain in use today, The War of Words reveals how popular news media outlets can, wittingly or not, foment international tensions and armaments during tumultuous political periods. 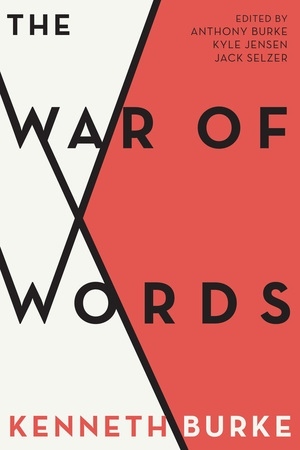 This authoritative edition includes an introduction from the editors explaining the compositional history and cultural contexts of both The War of Words and A Rhetoric of Motives. The War of Words illuminates the study of modern rhetoric even as it deepens our understanding of post–World War II politics. Anthony Burke is Associate Professor Emeritus of Astronomy at the University of Victoria and the son of Kenneth Burke. Burke worked with his father to organize and catalog Kenneth Burke’s papers. He now contributes to maintaining the archives associated with Kenneth Burke’s cultural legacy.